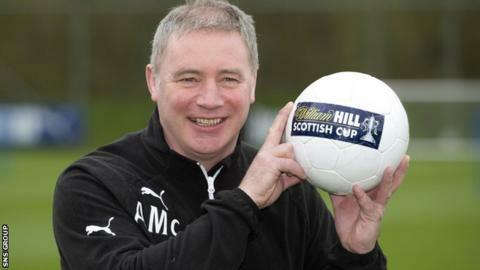 Manager Ally McCoist considers Rangers' season a success and says reaching the Scottish Cup final would be "a bonus". Dundee United are Saturday's semi-final opponents, with McCoist recovering from defeat in the Ramsdens Cup final. "We have done the job that was 100% required to do," he said. "We won the league at a very, very early stage and that was the number one target. "It would be an even bigger success if we could get to the Scottish Cup final and win it." We will definitely have to step up our level of performance, but we can do it. Rangers wrapped up the League One title last month with eight games to spare and remain unbeaten on league duty. However, McCoist has come in for flak following the 1-0 reverse to Raith Rovers last weekend. "It was certainly as low as some of the things that have happened to us in the past in terms of football results," McCoist said reflecting on the extra-time loss at Easter Road. "You tend to remember the defeats more than the victories. Thankfully we have had a lot more victories than defeats, but every defeat hurts. "Our target, in my opinion, is to get out of the division we are in. Anything else is a bonus. But don't get me wrong, we are looking for bonuses." United have been installed as favourites by the bookmakers despite Rangers enjoying the advantage of playing at their home ground of Ibrox, and McCoist accepts his side will need to improve on recent displays. "We have 100% faith in the plan and the way we'll play," he added. "It's part of the job being a manager, you get criticism when things don't go well. "I totally accept that and fully appreciate that, but we have not lost any belief in the way that we will have to perform, and can perform, to get a result. "United are a good, good side, they have some real talent and pace middle-to-front and good experience at the back. We will definitely have to step up our level of performance, but we can do it. "As down as we were last week, it's only the second game we have lost this season, both in extra-time, so we are looking forward rather than back." McCoist's troubles have been exacerbated by an injury list that includes Lee Wallace, David Templeton, Andy Little, Lewis Macleod and now goalkeeper Cammy Bell, who has been ruled out after suffering concussion. Steve Simonsen will deputise in what will be only his second appearance of the season and McCoist is sure the 35-year-old keeper will provide a safe pair of hands. "Steve's very experienced, he has performed very well at a number of clubs," he said. "He is very, very sharp in training. When he came in against Forfar he had arguably the save of the season."